A Wildlife hospital in Southern Australia has issued a mitten appeal to help treat koalas with burnt paws following the fires in South Australia and Victoria. Struggling heat-stricken koalas with burnt paws are in desperate need for mittens followed by the devastating bushfires in South Australia and Victoria. The International Fund for Animal Welfare (IFAW) has launched a public appeal in a bid to get cotton-made mittens from knitters to help treat injured koalas. 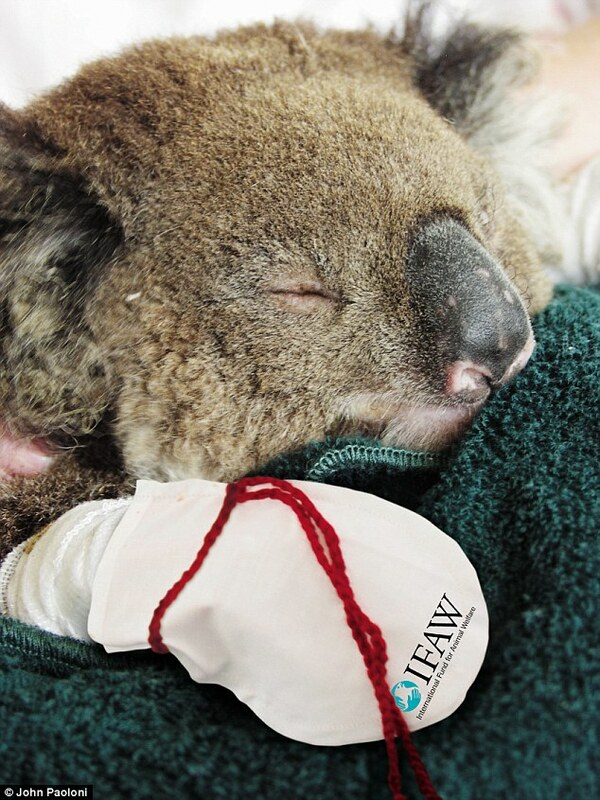 The injured marsupials typically come into care with severe burns, especially on their paws, caused by contact with burning trees or from fleeing across fire grounds. It comes as South Australia endured the state’s worst fire conditions since the Ash Wednesday and Black Saturday, destroying more than 30 homes and leaving 134 people injured. When koalas come into care, they get treatment with burns cream and their paws would be covered with bandages before being protected with the special cotton mittens. ‘We don’t know how many mittens we need but once the grounds are reopened to the wildlife rescuers, they will begin their black walk,’ an IFAW spokeswoman told Daily Mail Australia.